No story about the Dowd Agencies – the oldest insurance agency in Massachusetts under continuous family ownership – and its tremendous growth over the years can be told without a little background history first. Like many Irish immigrants who came to settle in Holyoke, James J. Dowd arrived in the Paper City in 1865 to build a better life for himself and his family. While Dowd worked in a textile mill, one of his sons would go on to create a legacy spanning five generations of Dowds. That son was his namesake, James J. Dowd, great-grandfather to John E. Dowd Jr., who today is president and CEO of the Dowd Insurance Agencies. “My father, who I miss every day, died when I was in the 10th grade. So, by the time I was old enough to develop a curiosity about our history, he wasn’t around to share his memories with me. But I did learn quite a bit from my aunts and uncles,” says John Dowd, who joined the agency in 1982. What he did learn was that his great-grandfather worked as a stock boy for a number of years in a grocery market in Holyoke owned by Otis Doolittle, eventually buying the store from him and becoming a business owner at a relatively young age. Now more than a century later, the Dowd Agencies has established strong relationships with a wide spectrum of A-rated insurance carriers and offers personal and business insurance, as well as employee benefits and planning for individuals and businesses. In the late 1980s, the agency embarked on a strategic plan that included both organic growth, which Dowd says it has “always been committed to,” alongside growth by mergers and acquisitions. It began by creating the Cray-Dowd Insurance Agency in Amherst in 1989, which recently moved to Hadley. Since then, it has expanded its footprint into other communities with offices in Southampton, Indian Orchard and Ludlow. The Dowd Agency reaffirmed its commitment to growth when last June it announced it was entering into a strategic alliance with a subsidiary of the Quincy Mutual Group. Through Quincy Perpetuation Partners, the new subsidiary, Quincy Mutual, invested in a 20 percent ownership position in the Dowd Insurance Agencies, which continues to operate as an independent, family-owned business. Dowd said the agency, as a longtime fixture in the Holyoke community, carries on his great-grandfather’s civic mindedness. 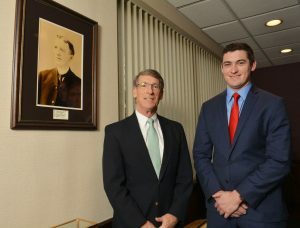 And that future is all but guaranteed to continue under family leadership as Dowd’s son, the fifth generation Jack Dowd, has joined the business after holding several positions with Goji Insurance in Boston. Bridging the GAP- Don’t Let Depreciation Put You at Risk!